Alex Kurtzman and Roberto Orci are coming on board to work on the screenplay for The Amazing Spider-Man 2, Sony Pictures announced today. They will also receive Executive Producer credits. The first draft for May 2, 2014 release was written by James Vanderbilt. Production is tentatively scheduled to begin in the first quarter of 2013 on the next “Spider-Man” film. The first film, The Amazing Spider-Man, opens in theaters this summer on July 3. 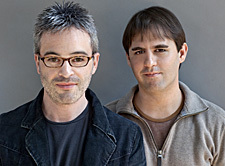 Together for over eighteen years, creative collaborators Alex Kurtzman and Roberto Orci have established themselves as one of the leading writing/producing teams working in film and television. This June, the duo will release People Like Us for Disney, which will mark the directorial debut of Alex Kurtzman. The film, starring Elizabeth Banks and Chris Pine, is written by Kurtzman & Orci and Jody Lambert. They are also in production on Ender’s Game and Now You See Me, both of which will be released by Summit in 2013. They are also producing and scripting a second installment of Star Trek with Damon Lindelof and All You Need is Kill, starring Tom Cruise and directed by Doug Liman. Erwin Stoff serves as producer of the film which is set up at Warner Bros.
Kurtzman and Orci’s writing credits include Star Trek, Transformers, Transformers: Revenge of the Fallen, Eagle Eye and Mission: Impossible III. They also executive-produced the romantic comedy hit, The Proposal. Kurtzman and Orci began their career writing for the popular television series “Hercules” and “Xena: Warrior Princess,” where they quickly became head writers at the age of 23. Next, they wrote for J.J. Abrams’ “Alias,” and eventually served as executive producers on the show.